Windshield Sun Shade. Premium quality. Shades your car windshield. Keeps car cooler by up to 50%. Customize Jumbo Size(63.3″X35″) for SUV, truck, car. Now available in US..
Are you wandering how to keep your car cooler even if it sits under the sun for hours? 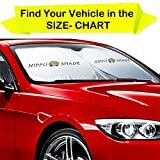 LOOK HERE —– Hippo Car Sun Shade is The Solution! Extreme UV rays often cause fading, cracking, and serious damage to your car interior, with Hippo Car Sunshade, you will surely have a long lasting and beautiful car interior for years! Hippo car sunshade is coated with Silver nylon that blocks 99% of the UV rays. Fast and easy to use. Installs & folds in seconds. What a breeze! Feel more comfort on a road trip or vacation, park your car under the sun and install your Hippo Car Sunshade and get back on a COOLER Car! It’s Amazing! Perfectly fits most car windshields and it’s available in Jumbo size that will surely fit in your vehicle. What To Expect When You Receive It? Folds-down to 1/10 of original size for compact storage and comes with a stylish pouch or quick and flat storage! Made of premium metallic reflective polyester (nylon) materials and blocks up to 99% of damaging UV rays! Perfectly fits most car windshields and is available in Jumbo size to fit all automotive solutions. This is why I recommend Hippo car sun shade to you! Enjoy using your sun shade for a long time with our 1 YEAR MONEY BACK GUARANTEE! Go ahead and click the “Add To Cart” button at the top right of this page, and get your new sun shade in a few days! ♛High quality car sunshades to keep your vehicle cool and damage free protects you, this high quality polyamide nylon car front window sunshade is a great helper for driver in summer and can effectively block sunlight, reduce the temperature inside of vehicle. ♛Keep your interior looking good, our sun shade protects your vehicle from UV damage. Helps protect vehicle’s interior – Prevents cracking & fading to dashboard and plastic trim. ♛Will fit all SUV’s, Trucks, Vans, and Cars with windshields not exceeding 62.7*35.4 inches! ♛It’s easy & convenient to use, a retractable style that folds down into a sleek pouch. Very nice! Now you will be able to easily store your sun shade without any hassle! ♛Hippo’s sun shade is higher quality than most sunshades on the market. We guarantee this sunshade can make you feeling refreshed with a cooler vehicle, and keeping a pristine interior. If you are caught in some problems when using our products, welcome to contact us at any time. Great accessory for your vehicle!
? Extreme UV rays often cause fading, cracking, and serious damage to your car interior, with Hippo Car Sunshade, you will surely have a long lasting and beautiful car interior for years!
? X-Shade car sunshade is coated with Silver nylon that blocks 99% of the UV rays. Fast and easy to use. Installs & folds in seconds. What a breeze!
? Feel more comfort on a road trip or vacation, park your car under the sun and install your Hippo Car Sunshade and get back on a COOLER Car! It’s Amazing!
? Perfectly fits most car windshields and it’s available in Jumbo size that will surely fit in your vehicle.
? Folds-down to 1/10 of original size for compact storage and comes with a stylish pouch or quick and flat storage!
? Made of premium metallic reflective polyester (nylon) materials and blocks up to 99% of damaging UV rays!
? Perfectly fits most car windshields and is available in Jumbo size to fit all automotive solutions.